We often hear the phrase, “Time is money.” In foodservice, that phrase has a lot of truth behind it. Customers want their food ready quickly. Operators want to serve that food in a timely manner, to create more opportunity for additional customers to eat. But while we live in an on-demand world where we expect things instantly, quite often, food prepared fast sacrifices quality for the sake of speed. But with the right foodservice equipment, operators can have both. 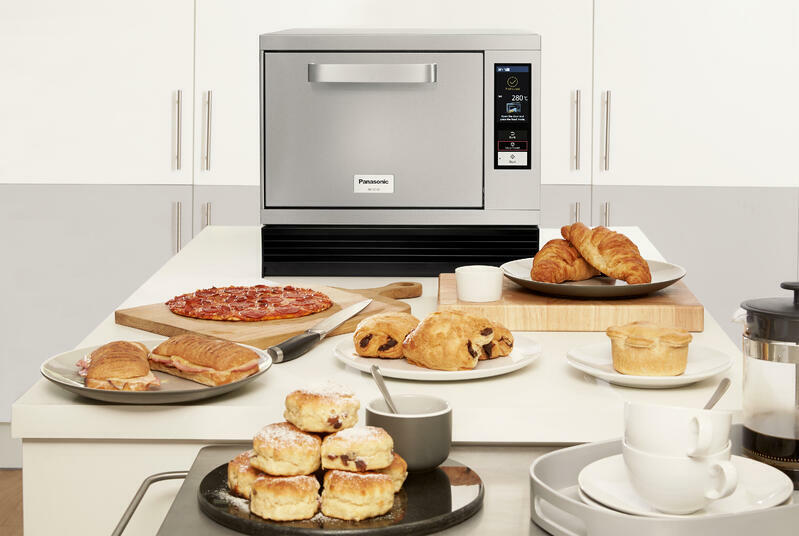 The Commercial High-Speed Oven is Panasonic’s latest addition to its line of innovative foodservice cooking equipment. Designed for cooking good food, fast, this high-speed oven cuts down on cooking times, satisfying both customers and operators alike. With a durable, stainless steel body that’s easy to clean and service, foodservice operators can rest easy knowing it’s also an oven that lasts. So what makes this speed oven different? And how can it benefit commercial foodservice operations in Maryland, Virginia, and Washington, D.C.? Let’s take a closer look at four standout features to know about Panasonic’s new High-Speed Oven. Utilizing Panasonic patented technology for rapid cooking, this high-speed oven combines convection, broil, and microwave functions for speedy heating of frozen, refrigerated, or room temperature dishes. This variety of six heating patterns using three functions (convection, grill, and microwave) offer quick, tasty, and fresh results in less time than ever before. This powerful oven is designed for commercial kitchens where space is at a premium. Both compact, and stackable, the small footprint from Panasonic’s High Speed Oven is great for convenience stores and small chains, where counter space is limited. With a color LCD touch panel, the speed oven is both easy to see and easy to operate, whether it’s a new hire or an experienced chef doing the cooking. Add to that a 1,000 recipe memory that’s editable right on the screen or through a computer, custom menu items can be cooked consistently, and exactly as they were intended. Ventless cooking is more popular than ever in foodservice. Not only does this ventless equipment eliminate odors and emissions, it doesn’t require kitchen hoods. With a ventless speed oven, it can operate anywhere. That not only saves space, but also cuts down on energy costs, which in turn saves the operator money. Learn more about the new Panasonic Commercial High Speed Oven and how it can help create a more efficient commercial kitchen. Schedule some time with our foodservice experts and see how this oven can help optimize your space.